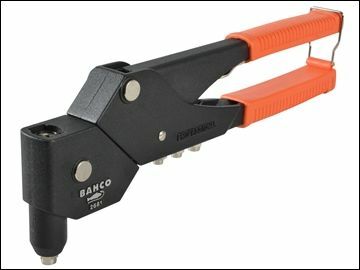 Bahco 2681 Riveter is a swivel head rivet tool, the head swivels 360° to rivet at any angle. Bahco 2681 Riveter is a swivel head rivet tool, the head swivels 360° to rivet at any angle. Will fasten metal, leather, canvas, and vinyl using 2.4, 3.2, 4.0 or 4.8mm rivets. With 4 interchangeable nosepieces which can be stored in the handle.